Do some cultural sightseeing at Queensland Museum & Sciencentre and Gallery of Modern Art. Deepen your sense of the past at sights like Chenrezig Institute and Caloundra Lighthouses. Explore Brisbane's surroundings by going to Art on Cairncross (in Maleny), Australia Zoo (in Beerwah) and Artworks in Clay by Anne Gentry-Smith (in Montville). And it doesn't end there: look for all kinds of wild species at Lone Pine Koala Sanctuary, see the interesting displays at Queensland Air Museum, take in the spiritual surroundings of Catholic Old St. Stephen's Church (chapel), and explore the activities along The Brisbane River. To see ratings, maps, reviews, and tourist information, go to the Brisbane travel planner . Algiers, Algeria to Brisbane is an approximately 28-hour flight. You'll lose 9 hours traveling from Algiers to Brisbane due to the time zone difference. Traveling from Algiers in March, expect nights in Brisbane to be much warmer, around 23°C, while days are a bit warmer, around 32°C. Finish up your sightseeing early on the 19th (Tue) so you can go by car to Gold Coast. Museum-lovers will appreciate Tweed Regional Gallery & Margaret Olley Art Centre and Ripley's Believe It Or Not! Surfers Paradise. Step out of the city life by going to Surfers Paradise Beach and Burleigh Head National Park. Take a break from Gold Coast with a short trip to Cape Byron Lighthouse in Byron Bay, about 1h 25 min away. And it doesn't end there: look for all kinds of wild species at David Fleay Wildlife Park, head outdoors with Pelican Feeding, explore the galleries of Watling Fine Art Galleries & Burleigh Framing, and play a few rounds at Surfers Paradise Golf Club. To find traveler tips, other places to visit, where to stay, and more tourist information, use the Gold Coast online trip maker . Traveling by car from Brisbane to Gold Coast takes an hour. Alternatively, you can take a bus; or take a train. 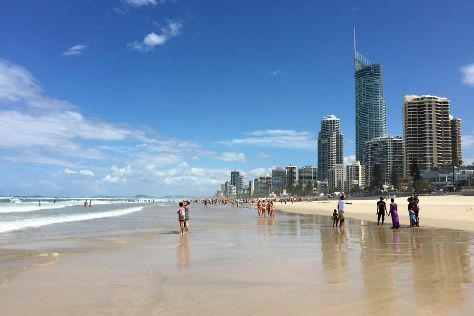 March in Gold Coast sees daily highs of 32°C and lows of 23°C at night. Wrap up your sightseeing on the 24th (Sun) early enough to travel to Sydney. Australian National Maritime Museum and Sydney Opera House are good opportunities to explore the local culture. Get in touch with nature at Bondi Beach and The Opera House to the Botanic Gardens Walk. Venture out of the city with trips to Katoomba (Wentworth Falls & Canyoning & Rappelling Tours), Pulpit Rock Lookout (in Blue Mountains National Park) and Featherdale Wildlife Park (in Blacktown). 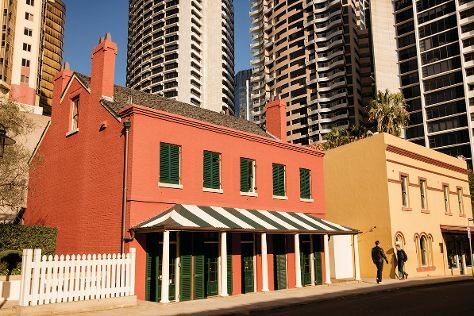 Next up on the itinerary: wander the streets of The Rocks, admire the masterpieces at White Rabbit Gallery, see the interesting displays at Hyde Park Barracks Museum, and don't miss a visit to Sydney Harbour Bridge. For traveler tips, maps, reviews, and more tourist information, you can read our Sydney travel planning app . You can fly from Gold Coast to Sydney in 3.5 hours. Other options are to do a combination of train and flight; or drive. Expect a daytime high around 30°C in March, and nighttime lows around 22°C. On the 2nd (Tue), you'll travel back home.